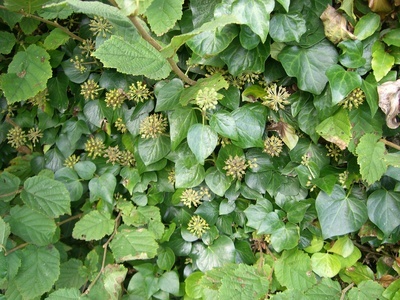 Not sure what you're asking ID of, here - if you mean the glossy green leaves with the funny white flowers, that's ivy (Hedera) and it looks as if its got a rogue Hazel mixed in with it. Above, some kind of grass, (lol), no idea which I'm afraid. 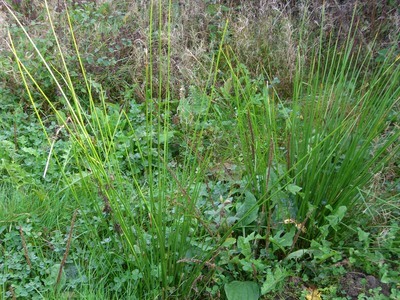 The top one is a Juncus (sedge). It is an indicator of sour, damp ground. Yep that looks like my Ivy with the flowers. You ought to pull out all the weeds around the grasses in the top pic, then you could see them better. i also think the top one is a sedge.